The First World War was an epic event of huge proportions that lasted over four years and involved the armies of more than twenty nations, resulting in 30 million casualties, including more than 8 million killed. 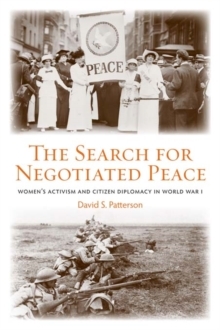 Set against the backdrop of this massive carnage, The Search for Negotiated Peace is the gripping story of the events that moved high profile American and European citizens, particularly women, into the international peace movement. This small, transatlantic network put forth proposals for changing the international system of negotiation. They supported non-annexationist war aims and attempted to discredit nations' secret diplomacy, militarism and narrowly nationalistic practices. Instead, they wanted to develop a `new diplomacy.' 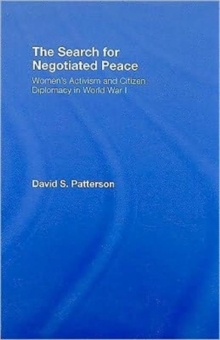 David Patterson skillfully develops the interactions of many of the notable leaders of the movement, including Jane Addams, Aletta Jacobs, and Rosika Schwimmer, into an absorbing narrative that brings together the various strands of women's history, international diplomatic history, and peace history for the first time. The Search for Negotiated Peace is an essential read for anyone interested in the social history of World War I and the foundations of citizen activism today.